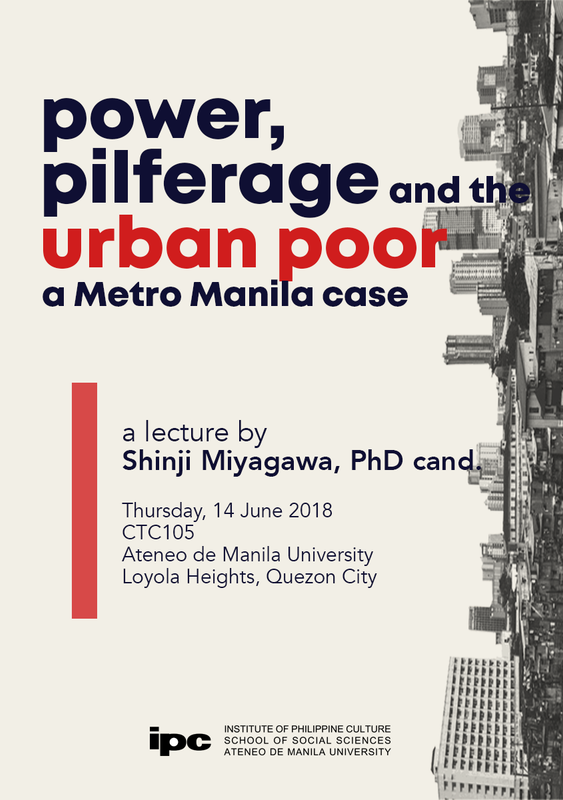 IPC VRA lecture by Shinji Miyagawa on "Power, Pilferage and the Urban Poor: A Metro Manila Case"
This study contributes to literature on the informal activities of the impoverished in developing countries. The researcher asks whether strict implementation of laws is the best approach to ensuring compliance or conformity. To answer this question, the study focuses on forms of electricity use in Metro Manila informal settlements and analyzes how these activities become legitimate. Using semi-structured interviews of over 300 households, the study provides a detailed account of three forms of electricity use, namely jumper (stealing from utility wire), submeter (resold by utility contractors), and utility contract. Shinji Miyagawa is a PhD candidate in International Relations at the University of Tokyo and is currently a Visiting Research Associate at the Institute of Philippine Culture. His area of interest is political economy of developing countries.